Lyft’s IPO could make co-founders John Zimmer and Logan Green very rich. 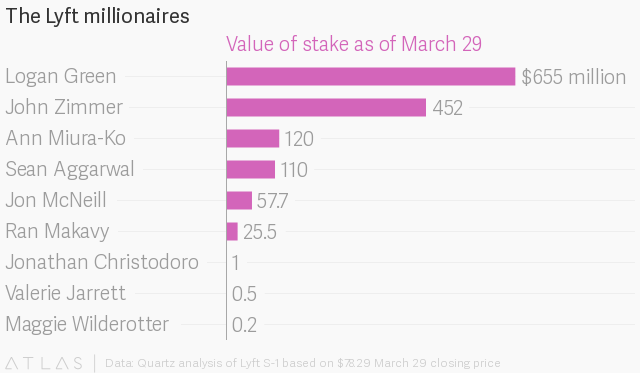 Lyft might not be making any money, but its investors and executives certainly are. Shares of Lyft Inc. gained 8.7% on their first-ever day of trading (March 29), closing at $78.29 after they priced at $72 in the initial public offering. The gain augurs well for Lyft; the company had already increased its IPO price range earlier in the week due to demand from investors. It’s also an early indication that the market is hungry for consumer-focused tech in a year when many such companies have signaled their intent to go public. One of the main questions with any IPO is who’s getting rich. In Lyft’s case, the company’s five biggest investors finished the first day of trading with stock holdings valued at $1 billion or more—unicorns in their own right. Japanese internet and electronics company Rakuten, Lyft’s single largest shareholder, finished the day with $2.46 billion worth of Class A common stock. General Motors and Fidelity followed with $1.46 billion and $1.45 billion worth of stock, respectively. Alphabet’s Lyft stake was worth only $924 million at the $72 IPO price, but the first-day gain pushed that up to $1 billion. Lyft’s IPO also minted plenty of in-house millionaires, including co-founder and CEO Logan Green, co-founder and president John Zimmer, and a handful of the company’s board members. Green and Zimmer each hold an equal number of shares of Class A common stock, but Green has about 2.6 million more units of Class B common stock, making his stake worth more and also granting him outsized control over the company. Class A common stock comes with one vote per share, while Class B confers 20 votes per share. Lyft sold only Class A stock in its public offering. This sort of dual-class share structure has become increasingly popular with technology companies over the past decade, as founders look to retain control of their companies after taking them public. The value of these stakes could still change substantially before their holders are able to cash in. That’s because Lyft’s executives and major shareholders entered into a customary lock-up period that prevents them from selling their shares for 180 days from the date of the company’s registration statement (March 28). A lot can happen in 180 days. Meal-kit company Blue Apron, for example, went public in June 2017 at $10 a share. By the time the bulk of its lock-up period for pre-IPO shareholders expired, the company’s stock price had tumbled nearly 60% to $4.03.